Isaiah Owens at his funeral home in New York City. Photo Credit: Marshall Stief. Snow falling on barren trees amplifies the scent of death in the air in the opening scenes of documentary film Homegoings as a casket is tucked away into a black hearse. It took filmmaker Christine Turner three years between shoots, but she finally managed to capture the absoluteness and beauty of death on camera. And more importantly, she captured the life in those who deal in death. “People who have been surrounded by death all the time just have these nuggets of wisdom,” Turner said via Skype in an exclusive GALO interview. Despite the somber nature of his work, Owens has a funny and humanistic side that isn’t depicted in the film, according to Turner. Filmed in a cinéma vérité style, with plentiful interviews and archival photographs, the documentary speaks to the fact that death surrounds us all, with no way of escape; though, many choose to ignore it until it is already too late. Turner hopes that Homegoings might change that attitude. “I hope that people feel more inclined to talk about things that are hard to talk about,” Turner said. 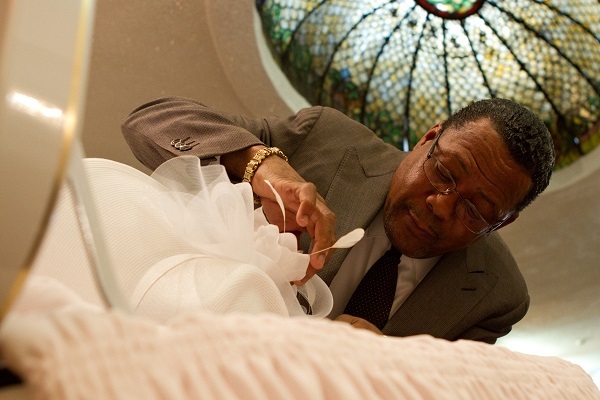 As the picture goes along, viewers can see Owens preparing for the funerals of loved ones in his own life, and giving what may be the most powerful line in the film when discussing his own end of life arrangements. Turner and I discuss that line, the beautification and understanding of death, and much more in GALO’s exclusive podcast. Listen to the interview below. Currently, the film is available on Vimeo on Demand. For more information about the film, please visit http://www.homegoings.com/. Video Courtesy of: Christine Turner.